Joint Action Committee for Bukit Gasing has been opposing Gasing Meridian’s proposed development since early 2006. GMSB first submitted application for development on its land on Bukit Gasing (believed to be acquired in October 1995) in 1995 for 8 blocks of Condos (16 stories each), 4 storey town houses (95 units) with 68 amenities units. Notice of this application submission is still up in Gasing Indah (KL Side). On 5th August 1996, a scaled down application with a number of bungalows was submitted. In June 1999, DBKL issued a 2 phased development order allowing for 71 bungalows, allowing phase 1 for works and would consider phase 2 thereafter. GMSB appealed against the development order and appeal was dismissed by the Planning Appeals Board on 25th August, 2000. The Planning Appeals Board visited the site and agreed with DBKL’s decision. GMSB then filed an application to the High Court seeking DBKL to issue a requisition notice, which was dismissed by High Court in 2001. In 2005, GMSB submitted a fresh application for new development order, we understand it would be for 142 bungalows. They also published their website for Sanctuary Ridge developments, with section for “Current Launch”. Some residents observed hoarding work commencing on 26th March 2008. Residents in the vicinity of proposed development and other representatives of residents’ association met the then Dato Bandar of DBKL, Datuk Haji Ruslin bin Hj Hasan to oppose the application on 19th Sept. 2005. Assurance that the application would not be approved and a right to be heard were made in a subsequent meeting. In April 2005, fresh representations were made to the then FT Minister, Datuk Zulhasan Rafique. At a meeting on 25th April 2006 with Dato Hj. Bakaruddin Othman, Timbalan Ketua Setiausaha (Peranchang dan Pembangunan, Kementerian Wilayah Persekutuan), assurance was given that no development would be allowed. As residents were still concerned that DBKL is still proceeding with GMSB application, JAC was formed and many communications and meetings were held with several authorities, including sending of two letters to the Prime Minister. A large public protest by residents was held on 19th November 2006, generating significant publicity for our cause. o technical reports will be available for review at DBKL office but no copies are to be taken or extracted. About 300 Residents had petitioned DBKL for a public hearing prior to the 14th November 2007 meeting. On 31st December 2007, DBKL delivered letters to those that petitioned for public hearing informing them that their request of a public hearing will be denied. 108 residents signed up as applicants for Judicial Review action to quash the decision by DBKL not to hold a public hearing. Leave to proceed with Judicial Review was granted on 17th March 2008, with an inter-parte hearing set for 23rd April 2008 to decide the “stay” on DBKL approving development until the outcome of the Judicial Review is known. Upon noticing the commencement of erection of hoarding, an emergence interim order to stop work was filed. The interim order to stop work was granted by Judge Abdul Wahab Patail on 2nd April 2008. Residents in the vicinity of the proposed development are acutely fearful of the risks of landslides and the spectre of a disaster with a magnitude of equal or greater proportion as that of Highland Towers. 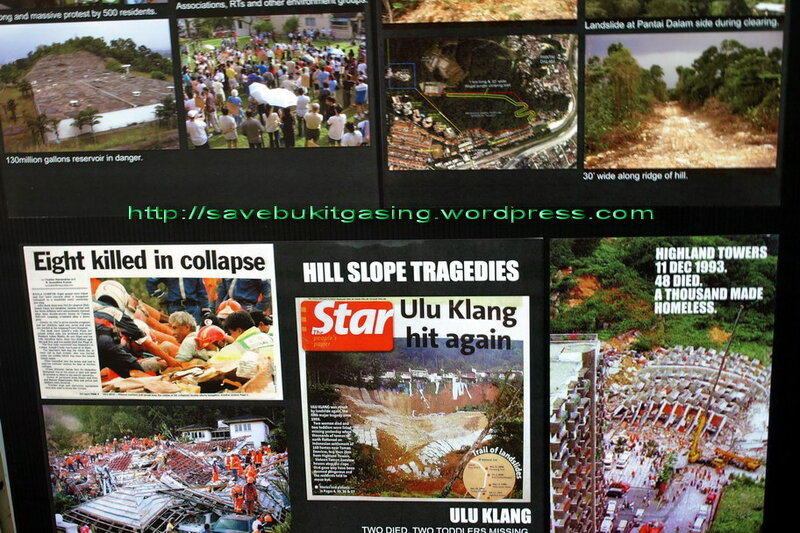 Bukit Gasing and its surrounding areas have a long history of instability, with studies that strongly suggests that any hill slope development will be an invitation to tragedy. In March, 2007, extension work on Sivan Temple resulted in a landslide measuring about 80 feet at the top and about 25 feet at the base with a fall of about 300 feet. To date and a year after the landslide, discussions are still ongoing with MBPJ and IKRAM to ensure mitigation work is done to good safety standards. Amelioration works are still on-going. Beginning of this year, we noticed a further landslide about 10 meters from the site of the March, 2007 landslide. A landslide along Jalan 5/62 occurred sometime ago and caused it to be abandoned. 3 bungalows along Jalan 5/64 were abandoned abruptly in the midst of piling works. A new reservoir with 23 million litres of water was constructed (built 2000) since Gasing Meridian’s earlier application for development in 1996 and DBKL’s approval then on strict 2 stage development approval process in 1999. Soil and geological experts and surveys have specifically cautioned against development on the steep hill slopes of Bukit Gasing. A 2meter (diameter) x 400 meter water pipeline (feeding to residents in PJ and wider) runs along from the reservoir along the entire western boundary of the proposed development site. Proposed development could well have construction work close to or on top of such a pipeline. GMSB has claimed that the soil structure had been safe for the 6 condos (Cameron, Fraser and Maxwell). However, it has been economical with the truth as the condos were built on terrain with gentle slopes that are in the main plateaus and “fit to terrain”. Proposed development will be on hill slopes with almost 50% of land on greater than 25 degrees gradient. GMSB has commenced work to construct hoarding along the boundary of its land pursuant to approvals that DBKL had provided. GMSB has also announced its intention to commence development soon and have started selling its properties widely in recent days. We need financial funding to pay our lawyers and court expenses. Our long term battle includes getting a public hearing with DBKL, getting a stop work order, then proving the site is too dangerous for any development, reversing the approval for development, and finally gazetting the site as a permanent green lung. We need resources such as information and expertise that will support our cause – engineers, geologists, experts, politicians (we already got Hee Loy Sian, Edward Lee, Sivarasa and Elizabeth Wong, andNurul, to support our cause and bring it up to higher authorities). We also need contacts with various organizations, bodies and societies that can help support our cause. Almost 800,000 metric tonnes of earthworks have to be removed, equivalent to 77 trips/day of 20 tonne lorries if earthwork was evenly spread over a 2 year period (based on information from GMSB preliminary EIA). A single phased development appears to form the basis of GMSB’s project plan (based on information from GMSB preliminary EIA). Its “Current Launch”, advertised via its internet website (http://sanctuaryridge.com.my/) shows properties would be from the top and along the ridge of Bukit Gasing. GSMB claims that its proposed development would be safe based on Federal Territories Ministry’s Committee on the Sensitivity of the Environment having reviewed the project with experts from IKRAM (Public Works Institute of Malaysia), the Department of Geosciences and Mineral, Public Works Department, the Department of Environment, National Soil Erosion Research Centre and Minerals. We are concerned as FT Ministry’s Committee on Sensitivity of Environment had only agreed that the application can be considered by DBKL and they are not the approving authority for development orders. DBKL should demonstrate via a Public Hearing what technical reports and studies have been assessed and be transparent on the objectivity of supporting agencies’ assessment of risks. It should also explain and receive feedback from residents and other experts regarding any conditions proposed on development and construction, including requirements for monitoring construction, responsibilities for long term maintenance of slopes and drainage. The safety of affected residents’ lives and properties must be a critical factor in DBKL’s consideration of hill slope developments. It must not limit itself to the rights of developers/landowners or otherwise limit its responsibilities at the exclusion of affected residents. Unsafe developments affect both residents in the vicinity of developments as well as new residents in the development.